LAS NAVAS, Northern Samar- Police Regional Director Chief Supt. Gilberto Cruz brought his “Lingap ng Kapulisan’ program to this remote town. Cruz said that their visit to the town is their way of showing that the Philippine National Police (PNP) is not only for securing peace and order but also provide assistance to the people. “Hindi po kami nagpunta dito para alamin o mag-tokhang o maging kaaway ninyo. Ang iba kasi ang tingin sa mga naka-uniporme mga kaaway, hindi ho totoo yun. 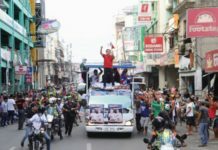 Kami ho ay nandito para magkaloob sa inyo ng kaunting kaginhawaan,” Cruz said. During the visit, dental services, optometry, medical consultation, circumcision, psychosocial support, and Philhealth membership cards were provided to the residents. School materials and toys were also distributed to the school children. Lt.Col Nilo Lapizar, commanding officer of the 20th Infantry Battalion based at the neighboring town of Catubig town, lauded the activity of the PNP. Lapizar said that this initiative of the PNP under the leadership of Chief Supt. Cruz, must be reciprocated by the villagers by helping government agencies in solving the problems that have plagued their respective areas. “Ang purpose namin dito ay makatulong sa community and at the same time, malutas ang problems at concern sa mga community. 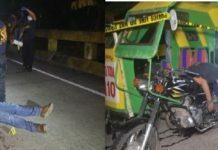 Alam din natin na itong ginagawa natin will lead the way na ang problema natin particularly sa kahirapan, sa insurgency na at least ang community marealize na ang gobyerno ninyo ay may ginagawa,” Lapizar said. Town Mayor Minda Tan expressed her gratitude for the visit of Cruz to their municipality. Tan said that with the services provided by the PNP personnel headed by Chief Supt. Cruz during their visit, her people was able to benefit them without shelling even a centavo.